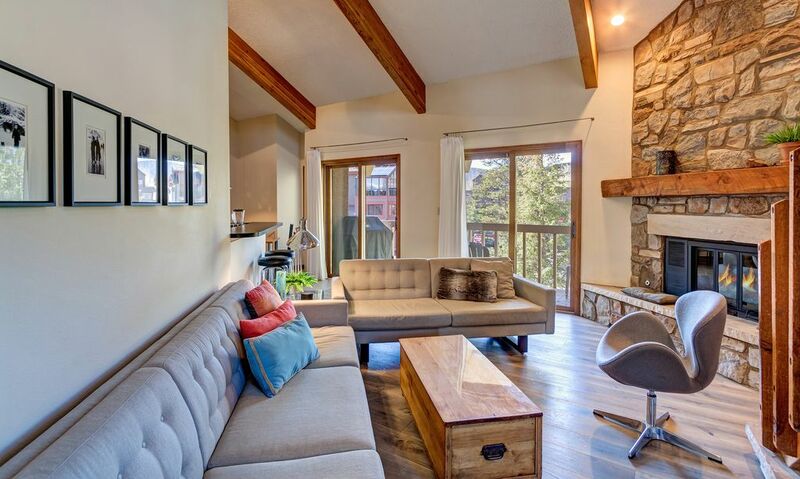 Scattered Pines Condo is located in the quaint mountain town of Frisco, CO. nestled on the edge of the Tenmile Mountain Range of the Rocky Mts. With 1800+ sq ft. this spacious 2-level provides ample room for your vacation. There are vaulted ceilings on both levels with lots of windows for mountain views all around. Enhancing it's unique floor plan and living area is an expansive rock fireplace and renovated kitchen with stainless steel appliances. On the main first level you'll find the kitchen, dining area, main living room and two bedrooms. Queen beds are in these two bedrooms. Each bedroom has its own private full bath. Upstairs on the second level is an extra large loft which has a second living area, a bedroom and full bathroom. This bedroom area has 2 twin beds and a bunk bed set; a queen futon is in this second living area. While situated in a quiet setting of pines and aspens, it's a close walking distance to restaurants and shops—just one block off of Main St. The bus stop for Summit Stage, the free bus system throughout the county and to the ski areas, is just a block away. Lake Dillon is located just two blocks away. Across the street there is a community tennis court that you may enjoy using in the summer. The extensive paved bike path throughout the county is just outside your door. Walk just one block behind the condo and you'll find Ten Mile Creek with a quaint walking bridge to take in the sights and sounds of this beautiful stream... and you might just catch a glimpse of a fox along the way. With it's spaciousness, this is a place where you and your group can relax and will have ample room to spread out. Please give me a call or email me if I can answer any questions or be of assistance to you. Thank you for considering my condo. Keywords: Condominium, 3 bedrooms, 3 full baths, 2 levels, free Wi-Fi, loft, large rooms, spacious, vaulted ceilings, quiet setting, easy parking, close to free shuttle, one block from Main St, one block from Lake Dillon and Frisco Marina, private laundry, deck, gas fireplace, Weber grill, close to bike path, close to tennis courts, skiing, hiking, biking, sailing, relaxing, adventure seekers, family space and gatherings, sight seeing. Thank you for considering my home for your stay in Frisco. I’m a Michigan native with a love for the mountains and a passion for skiing!! Being outdoors, being green, and being an animal lover—these are my other passions. I’m a freelance graphic designer living in Michigan but I spend 2 months here at the condo each year, spring and fall... keeping tabs on things and skiing as much as I can. I’m always working on projects to upgrade and keep the condo in tip-top shape. I’ve been coming to Frisco, since the age of 16, for ski vacations with my family. My love for the area and all it has to offer, both winter and summer, started way back then. Now in my 50s, I am fortunate to have this condo that I consider as my home and feel even more fortunate to have owned it for 20 plus years. For a period of time in my 30s I lived here. I love this place. The lifestyle here is laid-back and active at the same time, with all there is to do in this beautiful mountain and lake setting. I hope you will enjoy your visit and find it a place you’ll want to return to again and again, just as much as I have. Coffee filters and sugar are provided. An assortment of spices, olive oil, vinegar, flour, sugar, condiments and paper goods are provided. Dining table and chairs with seating for 6 and counter seating with barstools for 6. Community tennis court located across street. Very nice condo. Spacious, clean, well equiped. The condo was exactly as advertised. The rooms were large and well equiped. The beds were very comfortable. The fireplace was great. Overall the facility is very nice and a good buy for the price. We especially liked the location close to main street so we could walk to restaurants and happy hour bars. The house is comfortable and clean with everything we needed. Joan the owner was helpful and easy to communicate with. The condo was perfect for the three of us although it could accommodate more. The kitchen is a little narrow, although we mostly ate out. On our final day of skiing my friend was in a bad accident and needed surgery at the Vail medical clinic. The owner was great to work with as we tried to determine how long we would need to hold over. We had such a wonderful time at Joan's condo. We loved the location right in Frisco - we walked to dinner with the kids and enjoyed the town. The condo was a great set-up for two families with 2 kids each 5 & 8. The kitchen is a little on a small side but nicely equipped. Joan is a very attentive host, very detail oriented and has a very well cared for condo. I highly recommend this place. This condo is absolutely perfect! We had a lovely stay! The condo is comfortable, spacious, and inviting. There were plenty of extra blankets, pillows and towels, and a well-appointed kitchen. We were a group of 8 and there was plenty of room to spread out. The upstairs loft is a fun area. We appreciated the location - easy walking distance to shops and restaurants. The owner, Joan, is easy to work with, and just a phone call away, should you need. We were so pleased with the condo and plan to return for a future stay! Walking distance to Main Street, lots of room, comfortable beds, kids loved the large loft. Hope to rent again. Thank you Joan! Damage Protection: Renters have the option to choose a Property Damage Protection for a fee of $49.00 - OR - a refundable damage deposit of $300.00.